The reason: Changes in California’s election code and political boundaries make the state’s Democrats more vulnerable than ever before. California voters approved two measures in the past six months that will fundamentally alter congressional elections by giving an independent commission the power to redraw districts and placing the top two winners in a primary into the general election, even if they are from the same party. The new political landscape, expected to be announced next summer, will make it more attractive for aspirants to challenge incumbents. It could also push veteran lawmakers into the same district, leading to awkward negotiations over who should remain in Washington. California Republican strategist Tony Quinn estimated that the change in redrawing the districts alone could create as many as a dozen competitive districts in a state where successful challenges to incumbents are close to nonexistent. In a further threat to incumbents, a state constitutional amendment passed in June creates the possibility that two candidates from the same party could run against each other in the general election. Under the new rules, voters are allowed to cast ballots for any candidate in the primary, regardless of party. The top two winners progress to the general ballot. Critics charge that Capps, first elected to Congress in 1998, benefits from gerrymandering with a district that has been drawn to exclude large populations of Republicans. Capps has made no public announcement of 2012 plans. The WiseGuy IceMan Show has been canceled by the moderator, playing the dozens cuts no ice today. Nine vacuous opinions removed…. Email is preferred if you have a question. Nice to see that CCN has finally produced something to allow the misogynists to vent. Capps has go to be the least polarizing figure in National politics. But as history shows, boring can be a good thing in politics. 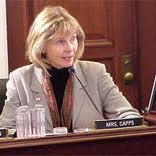 How true, there are worse things than boring , and Lois Capps is certainly not insane.